← Swingline Back-To-School Sweepstakes – Win $250 Gift Card and Free School Supplies! Welcome to Zuma’s User Guide, a quick “How To” that will save you time, money, and make shopping for office supplies easy! You will need an account to use many of these features. If you don’t already have one Click Here, enter your email address, name, and password. It takes less than one minute! Create a Favorites List for frequently ordered items so you don’t have to search for your favorite products each time. 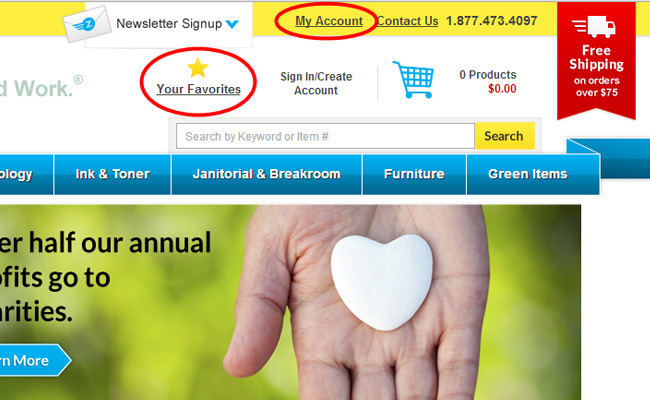 To add an item to Favorites, just click the “Yellow Star” below each product image. To view your favorites, log-in and click “Your Favorites” at the top of the page. Or click “My Account” in the top yellow bar of our site. To quickly add items to cart, click the Favorites link in the left column, check the box of the items you want to order, enter the quantity and click “Add to Cart”. Done! If you know the sku numbers of the products you’d like to order, this is a nice time saver! Click “Quick Order Form” in the Customer Service Block on the home page. 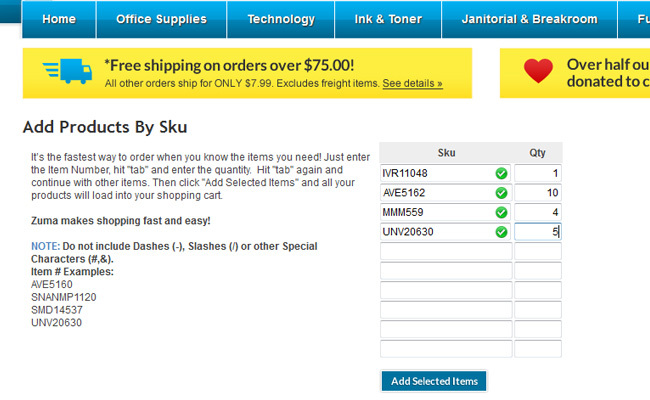 Enter the sku number, hit “tab” and enter the quantity. Hit “tab” again and continue. 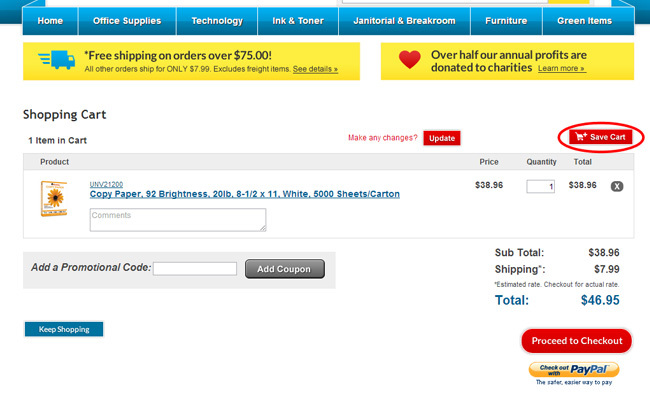 Once you’re done, click “Add Selected Items” and you will see all items in your cart. Saving your cart lets you build orders over time. You can start an order with items you know you need, then come back and finish it later. 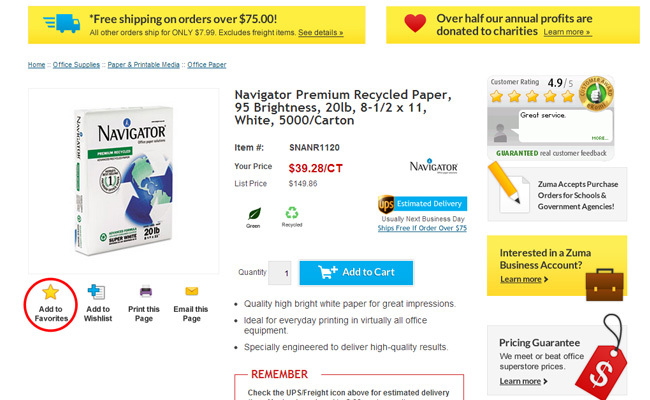 This helps you build orders over $75 for free shipping, and ensures you never forget an item you need. 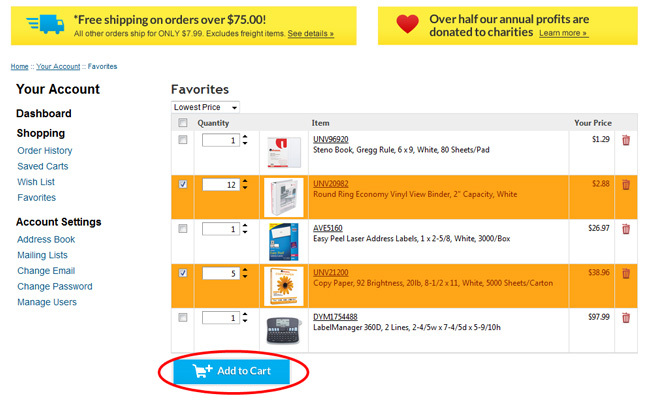 Just add items to cart and click the “Save Cart” red button on the Cart page. Then, name your cart and click “Save”. You can have multiple Saved Carts for different locations or departments. 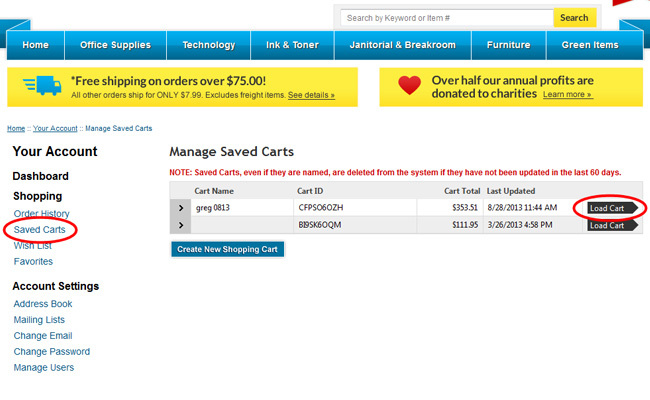 To retrieve your cart, log-in and click the “Saved Carts” link on the left side of the Account Dashboard. 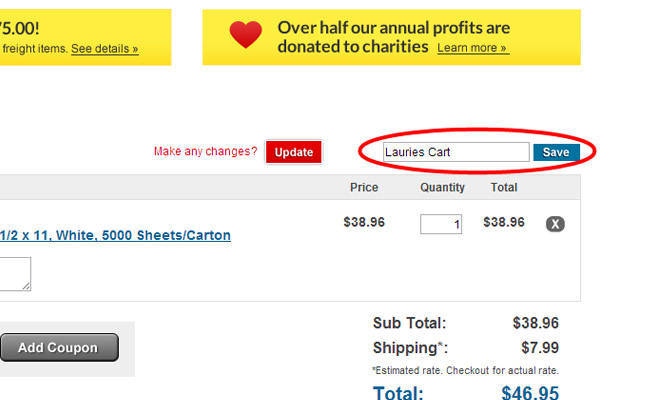 Click the “Load Cart” arrow to open your saved cart, and you can make changes, or place your order. Remember, each time you update your cart you must click Save Cart again. To see what you’ve ordered before, or to find items to load in your Favorites List, you can view Order History. 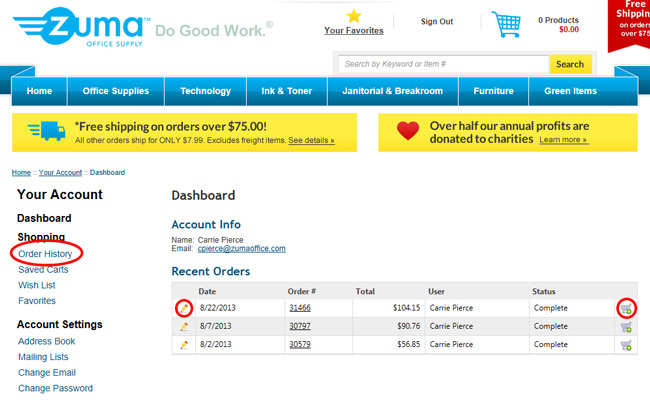 Log-in and click the “Order History” button on the left side of the Account Dashboard. To view an order just click the pencil. Cool feature…want to place the exact same order again? 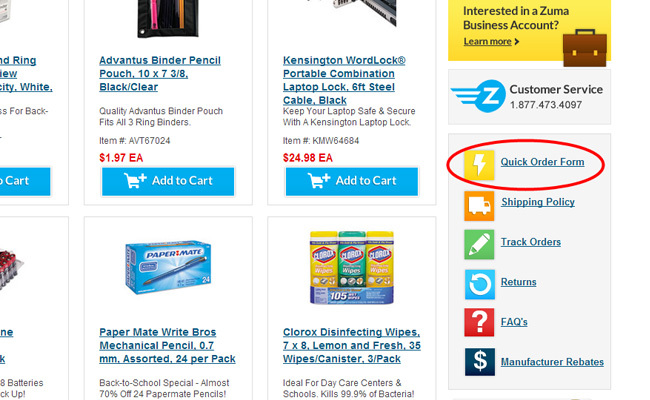 Click the little shopping cart button to the right, and what was on that order is automatically loaded to your cart! Most items are delivered the next business day. However, some large, more expensive items may have longer lead times because they ship by freight carriers. Also, we ship some products direct from the manufacturer to save you money, which can mean longer delivery times. Check the shipping icons on each product page for the estimated delivery time. These icons show on the right side of each product page. 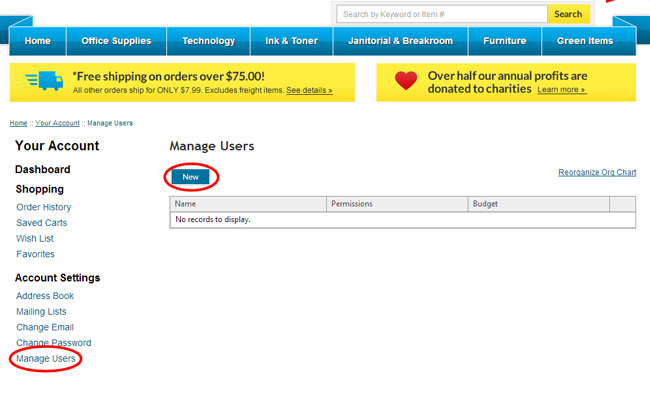 To add new users to your account, log-in and click the “Manage Users” link on the left side of the Account Dashboard. Click “New” to create a new user. You can require the new user to have orders approved, and you can set up budgets for those users if you’d like. It’s very easy! We always have great money saving emails with awesome gift cards, price discounts, and FREE products. You can sign up for our email newsletter at the top of any website page where it says “Newsletter Sign-Up”. Because we value your time, we never send more than two email specials per month. To see our available Coupon Codes Click Here. Or go to our blog at officesuppliesblog.zumaoffice.com and click the Coupon Code tab. To see all the Manufacturer Rebates available, click the link in our customer service block. 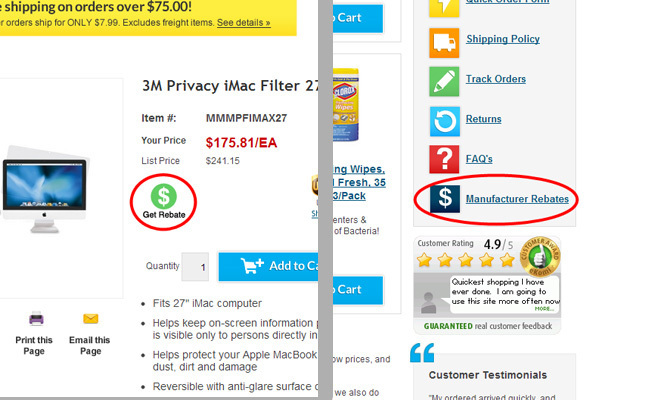 Or, if you see a green $ icon on the product page, click it and that takes you directly to the manufacturers rebate flyer. Remember, we are here to serve you. You’ll find when you call Zuma an actual person answers the phone who is ready to help you find what you need and answer any questions. Trust Zuma to help you do good work. That helps us Do Good Work through donating over half our annual profits to great charities that make a difference! This entry was posted in Office Supplies Shopping Tips and tagged Do Good Work, how to order office supplies, office products, office supplies, shopping tips, Zuma. Bookmark the permalink.